FOMC Minutes: "Further gradual increases"
In their discussion of monetary policy, participants agreed that it would be appropriate to maintain the current target range for the federal funds rate at this meeting. Participants generally judged that the economy had been evolving about as they had anticipated, with economic activity rising at a strong rate, labor market conditions continuing to strengthen, and inflation running at or near the Committee's longer-run objective. Almost all participants reaffirmed the view that further gradual increases in the target range for the federal funds rate would likely be consistent with sustaining the Committee's objectives of maximum employment and price stability. Consistent with their judgment that a gradual approach to policy normalization remained appropriate, almost all participants expressed the view that another increase in the target range for the federal funds rate was likely to be warranted fairly soon if incoming information on the labor market and inflation was in line with or stronger than their current expectations. However, a few participants, while viewing further gradual increases in the target range of the federal funds rate as likely to be appropriate, expressed uncertainty about the timing of such increases. A couple of participants noted that the federal funds rate might currently be near its neutral level and that further increases in the federal funds rate could unduly slow the expansion of economic activity and put downward pressure on inflation and inflation expectations. Participants emphasized that the Committee's approach to setting the stance of policy should be importantly guided by incoming data and their implications for the economic outlook. They noted that their expectations for the path of the federal funds rate were based on their current assessment of the economic outlook. Monetary policy was not on a preset course; if incoming information prompted meaningful reassessments of the economic outlook and attendant risks, either to the upside or the downside, their policy outlook would change. Various factors such as the recent tightening in financial conditions, risks in the global outlook, and some signs of slowing in interest-sensitive sectors of the economy on the one hand, and further indicators of tightness in labor markets and possible inflationary pressures, on the other hand, were noted in this context. Participants also commented on how the Committee's communications in its postmeeting statement might need to be revised at coming meetings, particularly the language referring to the Committee's expectations for "further gradual increases" in the target range for the federal funds rate. Many participants indicated that it might be appropriate at some upcoming meetings to begin to transition to statement language that placed greater emphasis on the evaluation of incoming data in assessing the economic and policy outlook; such a change would help to convey the Committee's flexible approach in responding to changing economic circumstances. In the week ending November 24, the advance figure for seasonally adjusted initial claims was 234,000, an increase of 10,000 from the previous week's unrevised level of 224,000. The 4-week moving average was 223,250, an increase of 4,750 from the previous week's unrevised average of 218,500. The dashed line on the graph is the current 4-week average. The four-week average of weekly unemployment claims increased to 223,250. The Census Bureau reports New Home Sales in October were at a seasonally adjusted annual rate (SAAR) of 544 thousand. 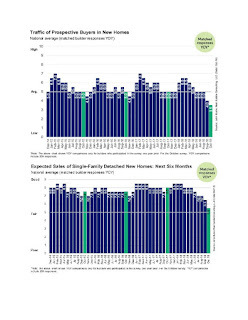 "Sales of new single‐family houses in October 2018 were at a seasonally adjusted annual rate of 544,000, according to estimates released jointly today by the U.S. Census Bureau and the Department of Housing and Urban Development. This is 8.9 percent below the revised September rate of 597,000 and is 12.0 percent below the October 2017 estimate of 618,000. " The months of supply increased in October to 7.4 months from 6.5 months in September. "The seasonally‐adjusted estimate of new houses for sale at the end of October was 336,000. This represents a supply of 7.4 months at the current sales rate." In October 2018 (red column), 42 thousand new homes were sold (NSA). Last year, 49 thousand homes were sold in October. The all time high for September was 105 thousand in 2005, and the all time low for October was 23 thousand in 2010. This was well below expectations of 575,000 sales SAAR, however the previous months were revised up significantly. I'll have more later today. Inventory, on a national basis, was up 1.1% year-over-year (YoY) in September, this was the second consecutive YoY increase, following over three years of YoY declines. The graph below shows the YoY change for non-contingent inventory in Houston, Las Vegas, Sacramento, and Phoenix (through October) and total existing home inventory as reported by the NAR (through September, October will be released tomorrow). (I'll be adding more areas). Note that inventory was up 52% YoY in Las Vegas in October (red), the fourth consecutive month with a YoY increase. Houston is a special case, and inventory was up for several years due to lower oil prices, but declined YoY recently as oil prices increased. Inventory was up 7% year-over-year in Houston in October. 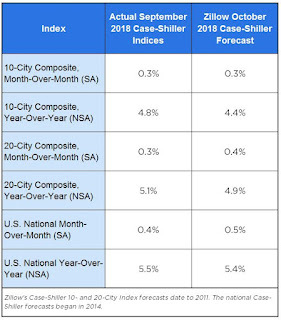 Inventory is a key for the housing market, and I am watching inventory for the impact of the new tax law and higher mortgage rates on housing. 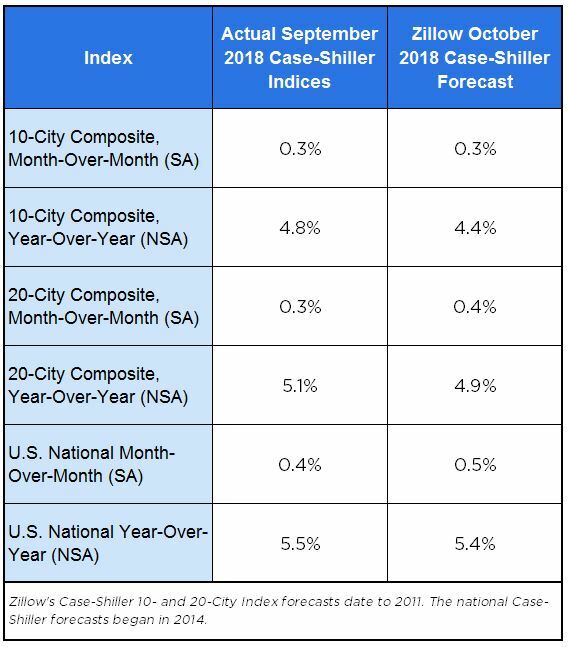 I expect national inventory will be up YoY at the end of 2018 (but still to be somewhat low). Also note that inventory in Seattle was up 102% year-over-year in October (not graphed)!